Draplin Design Co.: NOW TAKING ORDER: Pizza Kings Team T-Shirts!!! A couple days back my nephew Oliver was in the shop, telling me about baseball practice earlier in the afternoon. He saddled up to the monitors with me and we got to work on a Pizza Kings logo for the team, if anything, just for the hell of it. I had some ideas, of course, but even cooler than that, Oliver knew EXACTLY what he wanted in the logo. He’s almost eight and knows his stuff. We traded sketches and got to work. In no time, we had the design you are seeing up above. And just for fun, we posted it on Instagram, and had an OVERWHELMING response from everyone pledging to get a shirt to help out the team! So that’s what you are seeing here. We’re going for it. Our first goal is to get a t-shirt for each kid on Oliver�€™s team! All proceeds past that go to snacks and drinks for the kids. All proceeds past that get donated to the league. We’re gonna leave the post up for a good, solid week, and then place the order for the shirts. Hoping to deliver the things around mid May-ish! 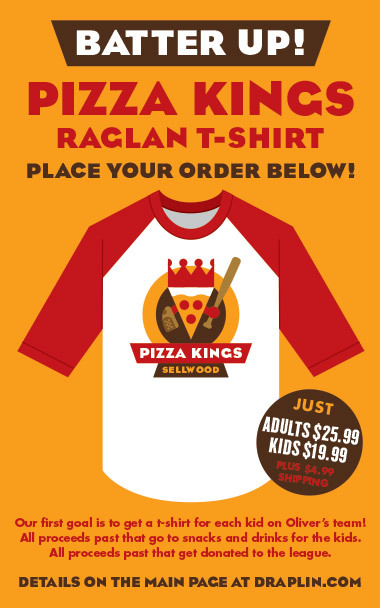 PLACE THAT ORDER and let’s get the Pizza Kings of Sellwood outfitted! Batter up! We’ll ship them AS SOON as they are done at the printer. Stay tuned, Pizza Kings fans!